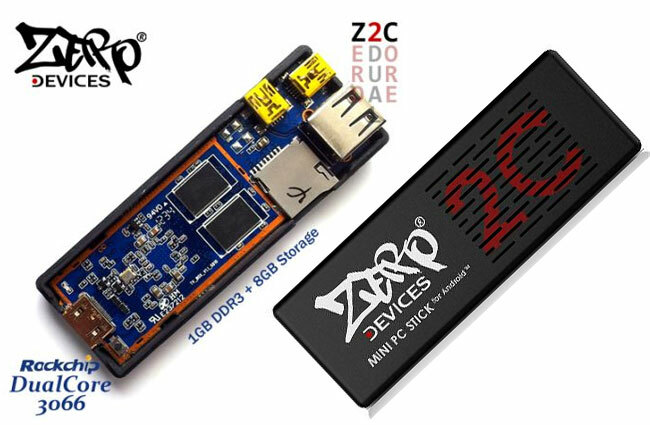 The Zero Devices Z2C is another Mini Android PC in the USB Drive format, based on the new, dual core Rockchip RK3066 processor. It is stated on Zero Device’s webiste that the Zero Devices Z2C will be available for shipping from Oct. 4th 2012 onwards but they are already accepting pre-orderings. Their price for this Android on PC device is U$S 82, which seems to be about right, given it’s specs. The Z2C includes Android 4.x Ice Cream Sandwich OS with all Google Apps preinstalled, including the rather essential Google Play Store. The RK3066 processor inside the Zero Devices Z2C includes a MaLi graphical processing unit, or GPU, which is about the standard thing in performance, allowing to play 1080p content without a glitch. The Zero Devices Z2C comes with a hefty 1Gb of RAM and 8Gb of Flash memory. It also includes a microSD slot to bump storage memory up to 16Gb. On the connectivity side, it includes two OTG USB and one HDMI ports. It is claimed on Zero Devices Z2C website that you can hook up an external USB hard disk with a capacity of up to 5Tb into it’s USB port, and still you get a second USB port free to plug an USB Hub with, say, an usb keyboard and mouse. The reference of such a big hard disk -which will need to be externally powered, of course- is given by them in order to make the Zero Devices Z2C even more appealing for multimedia playback purposes. You will use HDMI cable -which they claim in their website to be bundled with the Zero Devices Z2C- to hook up your Z2C into your TV or monitor screen, instead of directly pluging it into the TV. On the networking side, it includes WIFI 802.11 b/g/n connectivity. There is also a slave USB port which needs to be hooked into a functional USB in order for the Zero Devices Z2C to get it’s energy from. A final word, of caution: Until it starts to be used and abused by their owners, there is no real information about thermal control on this Android mini PC, which might -or might not- prove to be Achille’s heel on the Zero Devices Z2C design.